The Human Rights Working Paper Series (WPS) is dedicated to interdisciplinary and critical dialogue on international human rights law and discourse. It publishes innovative papers of the highest quality by established and early-career researchers and practitioners, from the University of Texas and other institutions around the world. The WPS provides authors with an opportunity to receive feedback on works in progress. It also seeks to provide a lively, productive environment for debate about human rights among academics, policymakers, practitioners, and the wider public. To this end we are launching a blog in the academic year 2015-2016 to host conversations, debates, and commentary related to the papers. We encourage submissions from scholars of all disciplines as well as from activists and advocates. 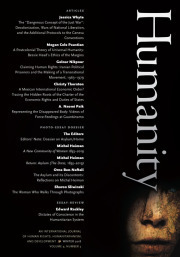 This year we are particularly interested in papers exploring the relationship between human rights and inequality, natural resource governance, and the future of labor. The WPS is edited and coordinated by an interdisciplinary committee that includes graduate students and faculty from across the University of Texas. Submissions are received on a rolling basis, reviewed, and then published online. This offers authors the opportunity to actively receive feedback and encourages readers to engage in debates surrounding human rights and social justice.